According to the book Genetic Justice: DNA Databanks, Criminal Investigations, and Civil Liberties — described as “the single most comprehensive articulation of the civil-liberties concerns associated with law-enforcement DNA databases,” “a series of measured arguments,” and “a touchstone for debates about the spread of DNA profiling” — an obscure genetic condition known as chimerism “could undermine the very basis of the forensic DNA system” and force a reconsideration of “the entire project of forensic DNA.” This conclusion is as unfounded as it is unnerving. 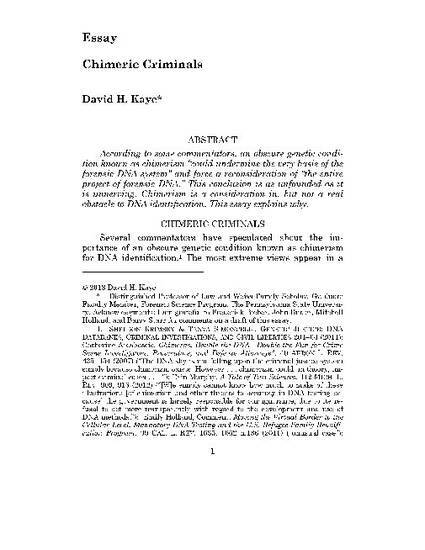 Chimerism is a consideration in, but not a real obstacle to DNA identification. This essay explains why. This article was originally published at 14 Minn. J.L. Sci. & Tech. 1-10.